Four young families, part of a volunteer organization called Mini-Mitzvah Corps at the Jewish Center of Princeton, recently planted seeds of native wildflowers at Herrontown Woods. 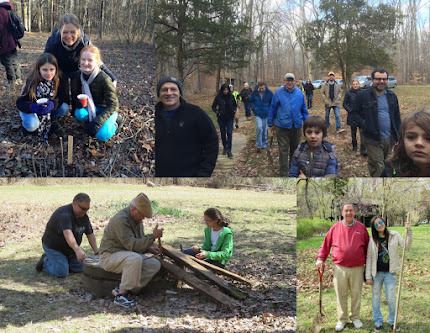 The planting was hosted by volunteers with the Friends of Herrontown Woods (FOHW.org), which is creating a botanical garden next to the parking lot where visitors can learn about the native flora of Princeton. The children helped plant a part of the garden we're calling the Veblen Circle, named after mathematician and visionary Oswald Veblen and his wife Elizabeth, who donated Herrontown Woods in 1957 as Princeton's first nature preserve. The seeds of Joe-Pye-Weed, Cutleaf Coneflower, and other native species were collected from local wildflower populations by FOHW president and naturalist, Steve Hiltner. Thanks to Marci Meixler for her efforts to organize the workday, and all the kids and parents who joined us for an enjoyable afternoon. As we were finishing up planting, we happened to see a bald eagle flying high overhead, which we took as a good omen. The seeds have since begun to sprout, with the help of some wet weather.